RailRunner®’s unique chassis can carry any standard domestic and/or international shipping container and operates both over the highway as well as over the rail. The specially designed chassis is built to withstand rail tension and compression forces of 400,000 lbs., sufficient for operating long trains with up to 150 container chassis and up to 5,200 trailing tons (depending on route parameters). 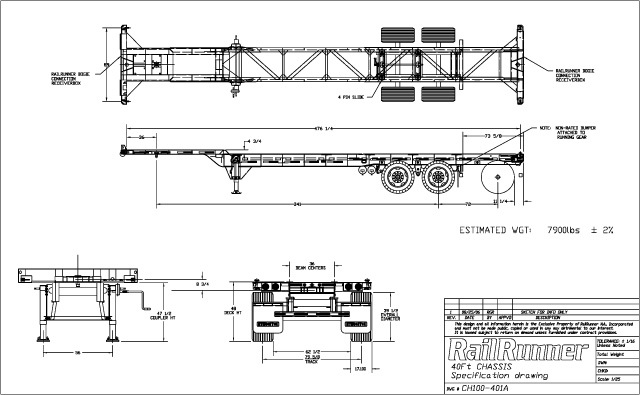 Each chassis is equipped with patented RailRunner front and rear receiver boxes for coupling the chassis to the rail bogies as well as with 1 ¼” diameter air pipe with gladhands for compatibility with conventional rail braking equipment when traveling by rail. Designed Rail Buff/Draft forces: 400,000 lbs.